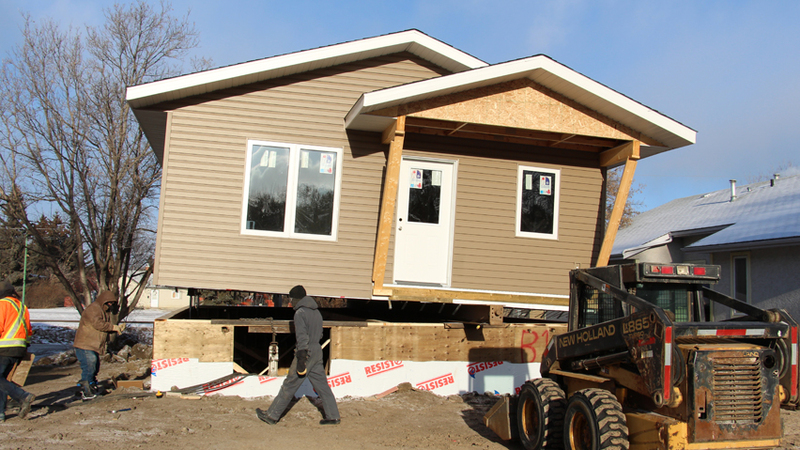 Sask Polytech and Prince Albert Habitat partnership – Habitat for Humanity Prince Albert Inc.
December 13, 2016 – Earlier today the second Habitat for Humanity home was moved to its permanent location in Prince Albert. This is the second house Saskatchewan Polytechnic carpentry students have built for Habitat for Humanity. In February 2015, Saskatchewan Polytechnic and Habitat for Humanity, Prince Albert, signed a memorandum of agreement for carpentry students to build five houses in five years. Under the five-year plan, the students will frame houses and install windows, exterior doors, siding, soffits and shingles. Habitat for Humanity funds materials for the homes and is responsible for finishing the interior of the house, aided by the families that will live in the homes. Houses are built at Prince Albert campus and later moved to a lot within the City of Prince Albert for the recipient family. Every year more than 63,000 Canadians volunteer with Habitat for Humanity Canada, a non-profit organization that builds affordable homes for low-income families in some 300 communities across the country. Habitat for Humanity, Prince Albert, was founded in 1995 and has served over 28 families. In recent years, Habitat for Humanity has built on average six homes annually in Prince Albert. Saskatchewan Polytechnic serves 27,000 distinct students through applied learning opportunities at campuses in Moose Jaw, Prince Albert, Regina and Saskatoon, and through extensive distance education opportunities. Programs serve every economic and public service sector. As a polytechnic, the organization provides the depth of learning appropriate to employer and student needs, including certificate, diploma and degree programs, and apprenticeship training. Saskatchewan Polytechnic engages in applied research, drawing on faculty expertise to support innovation by employers, and providing students the opportunity to develop critical thinking skills. Next PostNext Check out what is happening in Melfort!